I have mentioned this in the past, but my wife is a total fan of crab rangoon, and now my middle son is as well. What’s not to love about a crab rangoon? A little wonton purse loaded with cream cheese, crab, scallions, and simple seasonings, all bursting into your mouth in a couple of bites. I’ll admit, I love them to, and it is something we commonly default to as an appetizer if going out for American-Chinese food. Lately I had a real hankering for some crab rangoon, but I did not feel like making a bunch of wontons. It can be time consuming, so after I gave it a couple of seconds of thought, I decided I would come up with the crab rangoon egg roll. These crab rangoon egg rolls take a lot less time to make, and yield one whopper of an egg roll. 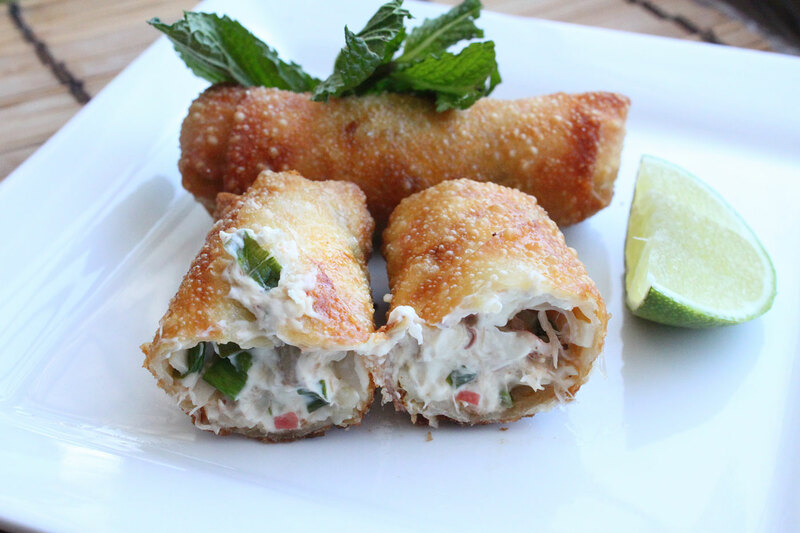 It’s a one and done type of egg roll due to the richness of the cream cheese, but that one is so darn good. Let’s get started. Keep in mind that you can half this recipe for about 8 egg rolls, however I doubled as I knew I would reuse the mixture for an upcoming holiday get together. Start by getting a medium sized mixing bowl ready. 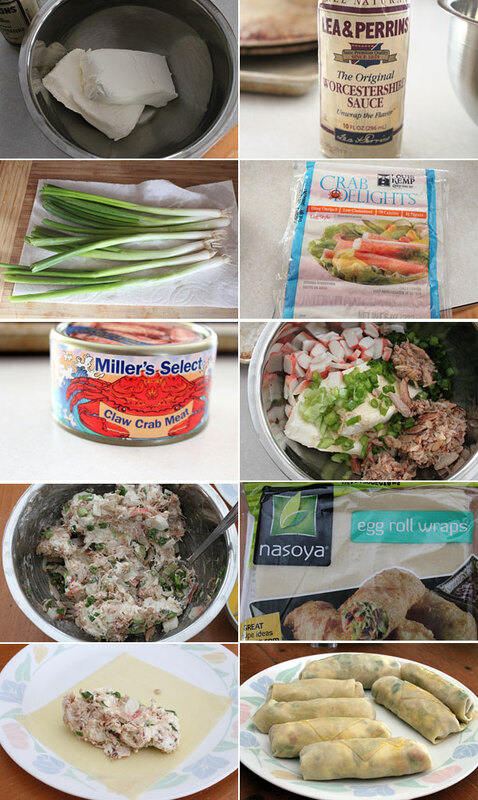 Add the bars of cream cheese, add the worcestershire sauce, salt, pepper, crab meats, and scallions. Using a form or spoon, mix thoroughly. Just make sure everything is nicely incorporated before putting into your egg roll wrapper. Next it is time to wrap your egg rolls. Get a couple of plates out. One one plate, add the egg roll wrapper, diamond style, meaning the points facing you. Add a heaping tablespoon into the lower center of the wrapper. DO NOT over stuff these babies. Next, take the point nearest you and fold over the mixture, gently pulling back to you. Roll one time, then fold over the side points. Continue to roll just until about done, leaving about an inch or so, then brush on some of the beaten egg onto that point. Continue to roll, sealing the egg roll. Repeat with however many egg rolls you desire. To a medium size pot, enough to house a few egg rolls to cook, add the canola oil, and bring to a medium heat, just until about 350 degrees. Add a few egg rolls, being careful not to overcrowd, and cook until golden brown. This only takes a matter of minutes. Once golden, remove with a slotted spoon onto a paper towel lined plate, and repeat. Let these cool for a few minutes before biting into them. They are piping hot. Once you are ready to dig in, give a dunk into your favorite dipping sauce, and prepare yourself to an unreal crab rangoon experience. Creamy, rich, crunchy, and just down right delicious. This one really lives up to its name, but in egg roll form. My wife and I joked and said ‘this egg roll probably equates to 4 regular crab rangoons, right?’. If you are looking for something neat, and a one and done, give this one a shot. It’s a great appetizer, and perfect this holiday season. Keep in mind that any leftover mixture can be stored or frozen and used in other things such as a crab rangoon grilled cheese, or a cranberry crab rangoon, you get the idea. Hope you enjoy!